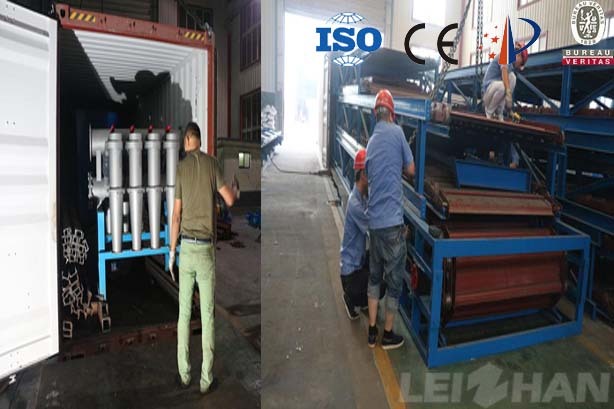 Recently Leizhan delivered paper pulp machine for Nigeria Paper Mill new 500t/d wrapping paper pulping line successfully, this pulping line use waste paper as raw material to produce corrugated paper and testliner paper, we supply the whole complete paper pulp machine for this pulping line, includes Chain conveyor, Drum pulper, High density cleaner, Pressure screen, etc. Delivered equipment: Chain conveyor, Drum pulper, High density cleaner, Pressure screen, etc. D type continuous pulping system: continuous pulping equipment contain Chain conveyor, Drum pulper, pulp chest, Drum screen, Ragger, Rope cutter and Grapple. Cleaner equipment: contain High density cleaner, Mid density cleaner and Low density cleaner, used to remove heavy and light impurities. Screening system: M.C. coarse pressure screen, Light impurity separator and Reject separator are used in coarse screening system, M.C fine pressure screen is fin screening equipment, the difference between coarse and fine screen is the screen basket, coarse screen is hole screen, fine screen is slot screen. Inflow pressure screen: used in approach system, to make pulp evenly flow to headbox. Meanwhile we also supply paper machine for customer like corrugated paper machine, kraft paper machine, tissue paper machine, culture paper machine, etc., if you have any need or question, welcome to consult us. Zhengzhou Leizhan Paper Pulp Machinery Co. Ltd.
© 2011 Zhengzhou Leizhan Paper Pulp Machinery Co. Ltd.